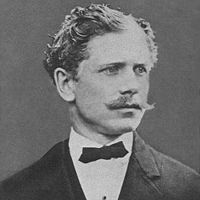 Ambrose Bierce (1842 - 1914, presumed) was born in Ohio, then raised on a farm in Indiana in a very large family with little money, but lots of books. He embarked on a newspaper career at the age of fifteen but, four years later, enlisted in the Union army and gave distinctive service there for many years before resuming his journalism career. Intelligent and ascerbic, Ambrose enjoyed writing satire and social criticism, and was lauded for a distinctive style which he displayed in multiple genres; in particularly, he is considered a master of the American short story. In a bizarre, late-life adventure, Ambrose traveled to Mexico and began traveling as an "observer" with Pancho Villa's army. He was last seen in Chihuahua and last heard from on the day after Christmas in 1913; no one knows what became of him, though there have been several movies and books speculating on his demise and final days. A delight! Politician, n. An eel in the fundamental mud upon which the superstructure of organised society is reared. When he wriggles he mistakes the agitation of his tail for the trembling of the edifice. As compared with the statesman, he suffers the disadvantage of being alive. Politics, n. A strife of interests masquerading as a contest of principles. The conduct of public affairs for private advantage. . . .from The Devil's Dictionary - Ambrose as apt today as then! Just love him!